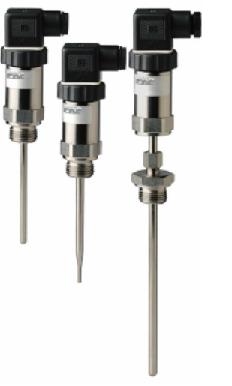 The TFK01 RTD Temperature Transmitter features a temperature-dependent electrical resistor integrated in a protective stainless steel tube. The resistance value changes as a function of the liquid temperature. In the model with an integral transmitter, this resistance value is transformed into a current signal (4…20 mA) or a voltage signal (0…10 V). The respective signal is then output at the 5-pin plug connection. In the model with no transmitter, the unconverted resistance value can be picked up directly at the plug connection. For short response times, there is also a version available with a tapered immersion shank. However, the best performance will be obtained when using an angle connector (DIN EN 175301-803).